Joe Jonas from the Jonas brothers band picture. Super Sale, quantity limited, subject to availability. A series of great celebrity photos.This Joe Jonas picture is 11" x 15" with a 16" x 20" mat frame, foam board backing, and 16" x 20" crystal bag. 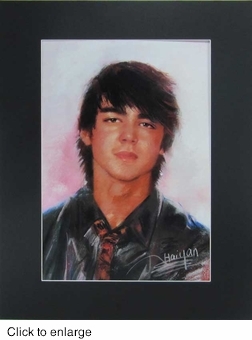 This Joe Jonas picture was painted by internationally well-known artist Hayiyan. Haiyan was the youngest student in history of the Luxun Academy of Fine Art at the age of 16. In 1984 she graduated and became the youngest professional painter in the Province Institute of the Fine Art of Heilongjiang, China.